As you may know if you read my travel tips e-book, I am all about ultra sun protection, especially if you'll be cycling, skiing, or hiking all day, as I often do. 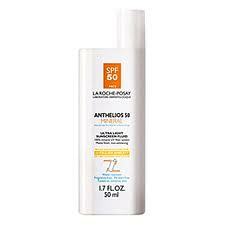 The company that makes the sunscreen I wrote about, Anthelios with Mexoryl SX, also manufactures a product that's perfect for everyday use (because it blends in so well) and for those who want a physical, rather than a chemical, sunblock. Let me introduce you to Anthelios 50 Mineral. Its main ingredient is titanium dioxide that, in other products, usually gives you a ghostly opaque appearance. Not with this product, if you blend it in properly. Plus, it doesn't feel greasy or heavy and absorbs well. Yet, you'll get plenty of protection (the SPF is 50) from both UVA and UVB, which contribute to skin cancer and skin aging. In addition, the product contains antioxidants -- they are plant derived -- which add another layer of skin protection since the sun's rays also lead to the production of damaging free radicals in the skin. When I've tried some other sunscreen products on the market, I found that they would contribute to me breaking out or they would irritate my skin. That was not the case with Anthelios 50 Mineral. Sure, the retail price for this product is steep: around $30 or so. But, I'm holding a sweepstakes where three people could each win a bottle of Anthelios 50 Mineral. All you have to do is post here where you would love to travel to use the sunscreen. And include your email address, twitter handle or FB info. (Please do not post your mailing address.) I'll randomly draw the winners and contact those who won. The contest ends midnight, March 17, 2013. It's only open to those 18 years old, and who have a U.S. mailing address. HI Pat, I adore the Galapagos. I do need your contact email, twitter account or FB page in order to reach out to you should you win. Woopsy! Thanks for the reminder...I must have been thinking about the Blue Footed Boobies. I would love to head back to Bermuda, the most peaceful and beautiful place I've ever been. As someone who is extremely fair-skinned and wears sunscreen year round, I am always eager to learn about new products and this sounds very intriguing. I need to slather it on for our upcoming trip to Dubai and then Phuket! Hi Kay, Sounds like it'll be amazing. But I notice that you didn't include your twitter handle or other way to contact you. Is your handle @BlBrTravel? Let me know so that if you win I can contact you. I would love to have this sunscreen with me on a sunny day when I'm somewhere in the Balkans -- how about a pretty spot in Croatia or Montenegro? I don't tan, I just get burned, so good suncreen is always important. I'm headed to Loreto, Mexico soon - sunblock required. Of course, being of Norwegian ancestry, I wear sunscreen protection year round, especially when I'm horseback riding.